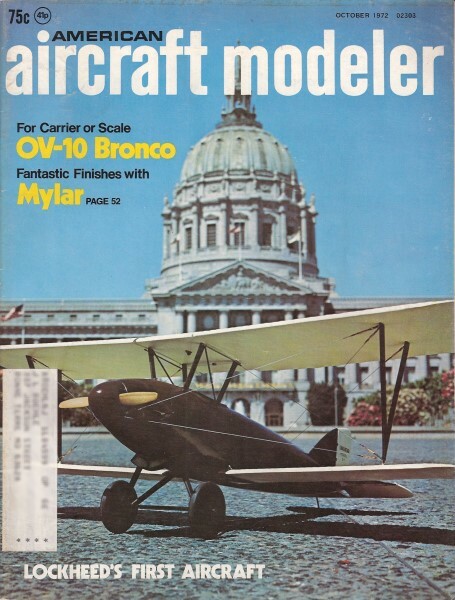 Here a historical article on the Loughead Sport Biplane Model S-1 Plans, that I electronically scanned from page 46 of my purchased copy of the October 1972 edition of AAM. Patricia Groves is the author. All copyrights (if any) are hereby acknowledged. Click here for the accompanying radio control model construction article and plans on the Loughead S-1. yet it directly influenced Lockheed designs for the next twenty years. 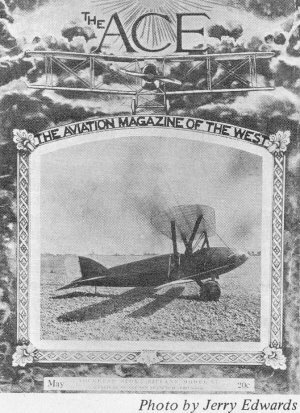 The ACE, a California-based aero magazine. S-1, and a little publicity for the April Aero Show. Loughead Shop Superintendent Tony Stadlman beside the newly-completed upper wing structure of the S-1. A few years later, Tony would ramrod the development of the Lockheed Vega. 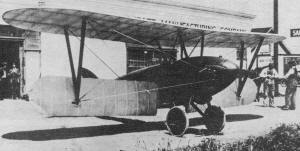 S-1 exercises her (lower) wings. 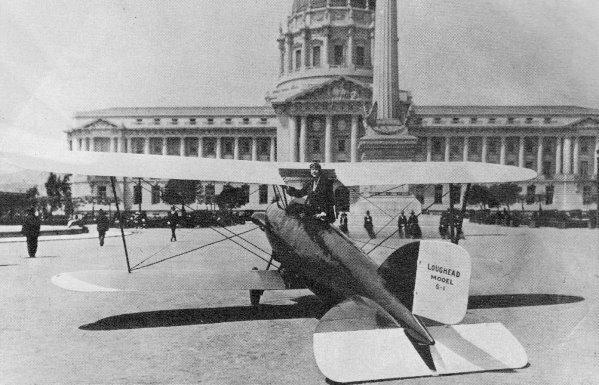 Before the end of World War I, the Loughead Aircraft Manufacturing Co. of Santa Barbara, California-like other aircraft companies the world over began planning for the expected post-war boom in aviation. Long before space age market research-type terms had been thought of, Allan and Malcolm Loughead (Allan legalized the phonetic spelling of the Loughead family name in 1934), Jack Northrop and Tony Stadlman got all their marbles together and thrashed out future options. Since the autumn of 1916, when it began in a corner of Bill Rust's garage, the Loughead Co. had expanded all through his shops at 101 State St. America was at war; investors and townspeople enthusiastically supported their local aircraft company and the men employed there. When Allan and Tony entered into the wildly expanding aeronautics industry in Chicago in 1910, the industry, as such, was a mere fledgling. It was a game, but a serious one. And, often, for keeps. Then, when Malcolm Loughead and Jack Northrop entered the field a few years later, they - like Allan and Tony ­ brought prior practical experience in automotive and mechanical engineering with them. By 1918, all four had witnessed aviation's phenomenal growth in the nearly 15 years since Kitty Hawk. In September 1918, when destiny finally brought them together in Santa Barbara, the chemistry of their individ­ual growth experiences, abilities and personalities catalyzed into a team. Over the months that followed, they quickly developed their own system of bal­ancing out individual pluses and minuses - a creative bloodletting that would lead to the Sport 1 Biplane. Within the context and course of daily work, the postwar possibilities were discussed, debated and decided on. A new aircraft, designed to fulfill the desires yet fit the abilities of the mass of wartime pilots then being turned out by the military, was eventually proposed. With this as the basic criteria, what was wanted was an honest airplane ­ easy to fly, and priced so anyone could afford it. It had to be strong and dur­able, easy to maintain, and inexpensive to operate. To compensate for the lack of airfields and hangar space, this new aircraft would be storable in any ordinary garage, and easily towed behind a car. And so that it could be flown out of the fields that were available, it would have short takeoff and landing characteristics. With the requirements established, the group grappled with design possibilities and construction methods. Of the then current fabricating techniques, the monocoque type of construction received a vote of confidence - if only it weren't such a flippin' pain in the neck. Then, with Malcolm supplying the initial impetus, the team worked out a new process. Eventually patented, the Loughead/Northrop/Stadlman develop­ment was the first practical attempt to apply plastic methods to aircraft con­struction. 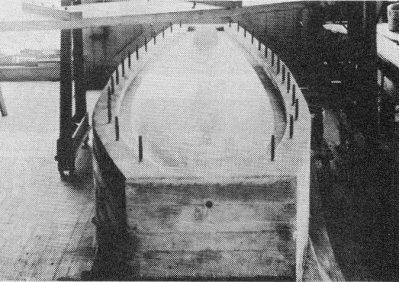 Prior to this development, manufacture of wood-laminated fuselages was an expensive and time-consuming operation because individual thin strips of wood, butted together, had to be laminated by hand over a series of elliptical forms. Since the adhesive on the first layer generally set up before succeeding layers could be applied, it was impossible to subject the whole structure to a uniform pressure to achieve the desired weld. Sometimes the whole affair wound up pinging and twanging asunder before the total operation was complete. And about the only "production" then was more and better ways of swearing. Not only was it a frustrating opera­tion in itself, but all too often separation occurred either between the butted­together strips and/or the layered sections - frequently at the most inopportune moments, such as during mid­flight. The method the Loughead group developed was a process in which individual thin strips of wood are fitted to the surface of a male mold so that the strips, as a unit, can be temporarily fastened to a removable form. Then, se­cure in this removable form, the com­pleted layer is removed as a unit, ready for use at any time. When a fuselage is wanted, the desired number of prefabricated diagonal and longitudinal layers, or units, is selected. The already prefabricated first layer is nestled into a concrete female mold and thoroughly slopped with an adhesive. Next a layer of binding cloth is placed on top and painted with the adhesive. A second prefab unit, put in place and coated, is followed by more binding cloth. After this layer of cloth is coated, the final wood layer is added. The completed ply is then subjected to intense and uniform pressure until the glue is set, after which it can be removed as a unit to be dried. This method produces a uniformly thick shell in which all control cables and horns can be totally en­closed within a fuselage. After months of jawboning and experimentation, Allan, Malcolm, Tony and Jack created the product: a neat little biplane and a whole new construction process. When the dimensions were finally established, Jack got down to serious drafting and Tony began work on the concrete molds. Since the S-1 was asymmetrical in shape, two molds were built. When engines were needed, both European and American makes were researched. A small, economical power plane was desired - a simple, uncomplicated engine made from easy to maintain and service standard parts. Overall, every aspect was considered in order to make maintenance and operation of the proposed S-1 a one-man job. It would be the ideal airplane, an all-Loughead airplane. However, to insure the success of the total venture, the group considered purchasing an established four­cylinder inline to be used in the proto­type aircraft until a Loughead engine could be fully developed and tested. By May 1919, a nation-wide Return to Normalcy campaign was in full swing. Even though aviation flourished ­ records broken, "firsts" being made ­ the aeronautics industry slipped into financial doldrums. Industry-wide, there were layoffs, cut-backs and major changes in direction. Investors cooled. But even though set adrift in these economic horse-latitudes, the boys at Loughead tightened their belts and staked their remaining financial re­sources, and future, on the Sport Bi­plane. In the months that followed, final engineering and construction began on the forms, the molds, tools and jigs, on all the things that would be needed to go into aircraft production. For the moment, work on the prototype engine was put on the back burner. Shortly after New Year's 1920, news of an air show planned for that April reached the Santa Barbara shop. Loughead quickly reserved space for the S-1 to debut at the San Francisco Aeronautical Exposition. And now, with a definite target date to shoot for, the company went all out. The decision was made for an all-Loughead airplane now. Let's not wait. And immediately, Allan and Bill Rust began pulling an engine together. As the S-1 neared completion, the company looked for an experienced ex­perimental test pilot. They found Gilbert G. Budwig practicing his chancey trade in Venice, California. But before making his decision to accept the job, Bud drove up to Santa Barbara to check over the new airplane. He'd already heard a lot about "unusual innovations" and, before risking his neck, he wanted to see what he was up against. Bud had a long-standing habit of examining the engineering and construction on any new airplane. A calculated risk is one thing, being a damn fool is something else. The design of the S-1's lower wings performed two unconventional functions: Instead of ailerons, each lower wing pivoted where it connected into the fuselage providing lateral control. Secondly, a special control lever allowed the entire lower ring to rotate 90° (after landing) and function as a very efficient air brake. 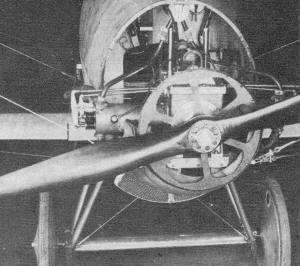 The upper wing, built in three sections (seven-gallon gas tank located in the center section), was held in place by latches. 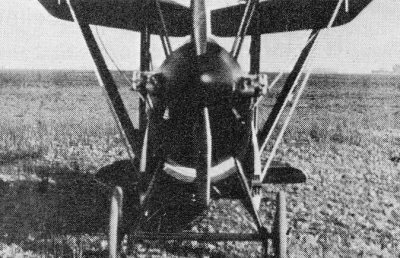 A V strut, supporting both wings, was solidly bolted to the upper wing spar and fastened to the lower wing spar by a rigid pivot pin connection. On the ground, both wings folded alongside the tapered fuselage to cut­outs in the horizontal stab. All this and a brand-new, untried, untested, 25 hp, two-cylinder opposed, water-cooled engine too! In fact, there was so much new about the airplane, Bud gave things more than his customary thorough going-over. To his amazement, and for the first time in his experience, nothing required reengineering. A test site and date were picked. 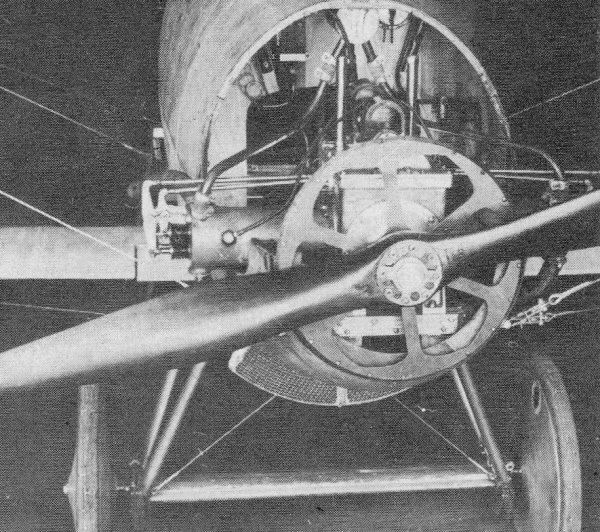 As Bud settled into the cockpit on the afternoon of April 11, 1920, a pair of eager hands laid onto the S-1's 5-1/2 foot Jacuzzi prop and pulled it through. The little experimental engine whirred to life. While her anxious builders watched, the plane rose cautiously from the ground. Then, almost imperceptibly easing off at a couple hundred feet, Bud made a solicitous and gentlemanly "pass" at his controls --- especially roll. Surprise! She responded. With a new measure of confidence, Bud then climbed to 1000 ft. and leveled off. Because of the newness of the engine, he didn't want to open her up full bore. Nor, since longevity is undeniably linked with discretion, did he care to wander too far from a suitable landing spot. After a couple lazy 180s over the field, Bud decided to test out her landing characteristics and the effectiveness of the air brake wing. Making a long, low, slow-in approach, he cut throttle, and "she squatted like a duck" before he could release the air brake lever. He taxied over to the happy on­lookers to check out what further testing they wanted done. Shouting over the idling engine he said he'd noticed that engine compression seemed a bit low and he wanted to go back up to see if he could "kick it up a little." "No. It flies!" Allan grinned. "We'll finish testing later. Right now, let's get 'er dressed off and up to San Francisco." A few days later, all gussied up and shiney, the S-1 attracted favorable attention at the air show. Besides enticing potential investors in the struggling company, there was a definite sale contingent on a flight demo. After the show closed, Bud was called up to Redwood City, just a few miles south of San Francisco. Here they continued test work and attempted to improve engine compression. But a disconcerting chain of events was already in motion, including the government's dumping of surplus aircraft on an already strained aviation economy. No individual buyer was interested in a $2500 airplane when he could get a brand new, in-the-crate Jenny for less than a quarter of that amount. And attempts to jack up lagging horsepower in the Loughead engine, as Bud would say later "were superfluous." In our interviews, Bud staunchly maintained that all the ideas incorpor­ated into the S-1 were sound. As far as the engine was concerned, it wasn't a lack of dependability but just a frustrating lack of "oomph." Today, Jack or Tony would dearly love to disassociate all kinship with that engine. But the fact remains, within the unitary function of the team - then and later - well, neither one of 'em should take any blood tests. So the S-1 became a one-of-a-kind, and one more company went belly up. Yet, if that were the entire story, the whole thing would be a bore. Something was created that wouldn't die or disappear: During the 20s an aeronautical incubation was developing into a new era. Soon there was the necessary financial as well as experimental and technological progress. The air was supercharged with engineers, construc­tors, aviators and mechs moving around in an exciting stream of growth and discovery. Within this whirlpool, Allan, Jack, and Tony would get it all together again. It was the possibilities inherent in the basic idea that led to an improved and updated S-1, the Lockheed Vega. And there's one helluva success! With basic Loughead engineering and construction methods, the influence of the Lockheed Vega was far flung and imitated. The influence of the Vega in both Douglas and Consolidated aircraft of the period is undeniable. And, although the old Loughead Co. eventually changed hands (and spelling), the foundation and the initial attraction was there. Begun by Allan, Tony, and Jack, this attraction subsequently drew the aeronautical young "comers" to fol­low Jack Northrop, Gerry Vultee, Larry Bell, George Prudden, Kelly Johnson and others to develop and spread their influence throughout today's aircraft industry. S-1 a flop? Not a bit.